Right up until the reveal, people are enjoying trying to guess. Is she really on the Doctor’s side? Or is there something more to her? Is she actually not such a good person? Even once we know who River is, I don’t think we’ve lost her potential for adventure. And Baby Makes Four! DWM takes a peak at what we can expect from Steven Moffat’s game-changing episode, A Good Man Goes to War. Where is Amy? Who is the Eye Patch Lady? What is River’s secret? All will be revealed… or will it…? Have You Met My Wife? Suranne Jones talks exclusively to DWM about what it was like to play Idris – the TARDIS given physical form, in the amazing episode, The Doctor’s Wife, written by the award-winning Neil Gaiman. Goodbye Sarah Jane… Following the sad news of the death of Elisabeth Sladen, DWM commemorates the much-loved actress and the character of Sarah Jane Smith that she created. Doctor Who’s commander-in-chief, Steven Moffat reflects on the enduring popularity of the character in his latest Production Notes; and former Doctor Who showrunner and executive producer of The Sarah Jane Adventures, Russell T Davies shares his fond memories of working with Elisabeth. Plus, an obituary and a selection of the many letters received from readers. Seeing Double! DWM braved the biting cold to report on the disturbing two-part adventure, The Rebel Flesh/The Almost People and was able to talk exclusively to the cast and crew, including author Matthew Graham, actor Raquel Cassidy, and director Julian Simpson. Gentlemen Adventurers From 1977’s The Talons of Weng-Chiang to their own series of adventures on audio, actors Christopher Benjamin and Trevor Baxtertalk exclusively to DWM about playing Victorian detectives Jago and Litefoot. End Of An Era As the 60s draw to a close, so too does the tenure of the Second Doctor as COUNTDOWN TO 50 reaches Series Six which introduced both UNIT and the Time Lords to Doctor Who mythology. Running Out Of Time! Amy and the Doctor confront nuns with guns when they land inside an abandoned alien vessel where time is the enemy in Apotheosis, the first part of a new comic strip adventure by Jonathan Morris with art by Dan McDaid. Return Of An Old Acquaintance… The Time Team take a trip to the subterranean layer of tycoon and extraterrestrial collector, Henry van Statten to see the Doctor confronting an old enemy. Will Dalek be to their taste? Gone To Pieces… Summoned by the White Guardian, the Doctor is charged with the mission of finding the six segments of the Key to Time and the Time Lady Romana is assigned to help him in his task. Fact of Fiction examines The Ribos Operation from 1978, and tracks down some fascinating facts about the adventure. PLUS! A FREE giant-size, double-sided poster, all the latest official news, previews, reviews, competitions, more madness from the Watcher, another prize-winning crossword, and much, much more! 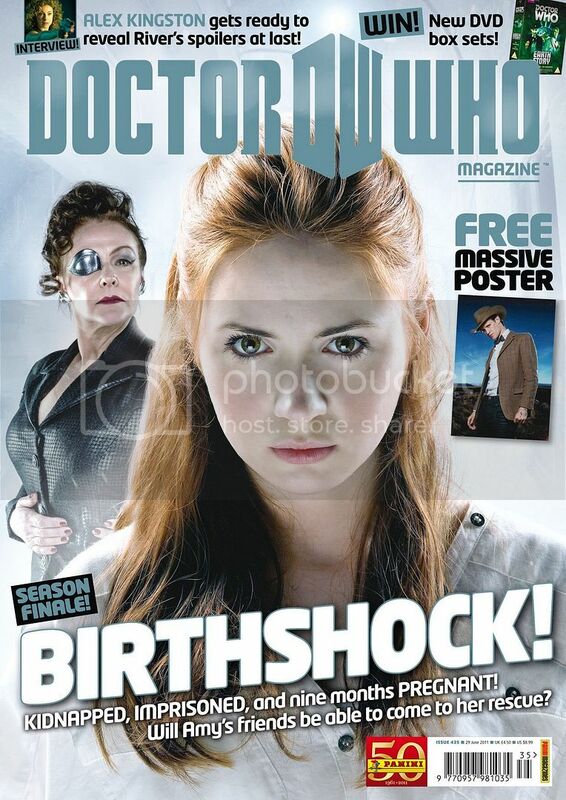 Doctor Who Magazine is available from all good newsagents and supermarkets from Thursday 2nd June.